Recently the AA Traveller Facebook page conducted a poll on the most popular beaches in NZ. Caroline Bay was rated 4th overall and easily the most popular in the South Island. Finishing in the top 10 entitled Caroline Bay to signs promoting its popularity. Caroline Bay is the most widely known of all the parks in the Timaru District. When speaking to some from outside Canterbury about Timaru they will usually mention Caroline Bay, whereas locals will often refer to it as 'The Bay'. The beach is sheltered by the harbour breakwater and is the only sandy beach between Oamaru and Banks Peninsula. March 2014 saw Caroline Bay beach being voted the most popular beach in the South Island. Allied with the popular swimming beach is the annual summer carnival run by the voluntary Caroline Bay Association. The carnival has been operating for over a hundred years and draws people from around much of New Zealand to attend or assist with its operation. The carnival is a traditional family affair with free concerts, rides and sideshow style games. Caroline Bay itself is located between the Pacific Ocean and the Timaru Central Business District, being separated from the main shopping area by the South Island Main Trunk Railway lines. The Piazza straddles the railway line and provides access for pedestrians via a grand staircase or via a lift which is unique for a public park in this country. Caroline Bay covers an area of 34 hectares excluding the beach. The dunes of Caroline Bay were awarded the Best Dune Re-vegetation Project trophy in 2010 after they were revegetated with native sand binding plants. Today the established plantings are likelyto be the most diverse in the country and studied by university students. Little penguins have now established a colony in and around Caroline Bay. Check out our Diary of Major Events that have occurred on the Bay over the years from 1876 under Related Documents. Caroline Bay is the most popular outdoor events centre in South Canterbury as well as being a very popular recreation area. We are also lucky enough to have the Trevor Griffiths Rose Gardens with the roses flowering from November until July. Timaru has a fine collection of Old Roses. These are a style of rose that is bred to have a shorter flatter flower, rather than the taller tapering flower of Modern Roses. This is largely as a result of the legacy of the late Trevor Griffiths, a local rosarian, who specialised in growing and writing about old roses. 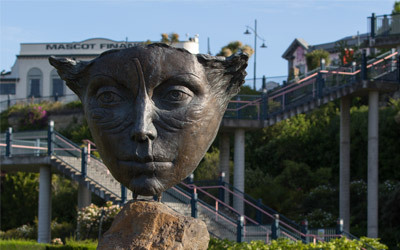 Public artworks such as sculptures and a mural, along with items of historical significance make a visit to Caroline Bay a culture and educational experience. Ample carparking and indoor venues complement the outdoor venues to cater for many events. Caroline Bay also contributes to the landscape by giving world class views over its green area and across the sea to the distant mountains which are often snow covered in winter.